RDD Lockits – for “Double D” and Round Mounting Holes. ST Lockits – for Rectangular Mounting Holes. Pre-Assemble Lockits onto cable for faster final assembly! Watch this equipment in action. Assembly head for RDD and ST Lockit Strain Reliefs. Simply place a Lockit Strain Relief into the "U" opening of the assembly head. Then place the cable into the bushing body and close the head to secure the Lockit™ Strain Relief permanently onto the wire. This completed sub-assembly can then be installed with fingertip pressure into the application's mounting hole-at a later time, in a different place, for lower installed cost! Assembly machine for RDD and ST Lockit Strain Reliefs. This foot-pedal activated assembly machine is identical to Autolock™, except that the gravity fed track is loaded by hand instead of by a vibratory bowl. Assembly machine for RDD and ST Lockit Strain Reliefs. Suitable for high volume production runs where batched sub-assemblies are desirable. Includes vibratory feeder bowl, track and head. The operator simply inserts the cable into the assembly head slot, then presses the foot pedal to secure the Strain Relief permanently onto the wire. This completed sub-assembly can be installed with fingertip pressure into the application’s mounting hole–at a later time, in a different place, for lower installed cost! Equipment for European requirements (motor power ratings and shielding) available, consult Heyco. D - RDD Lockit™ Guillotine - for fastest final assembly! 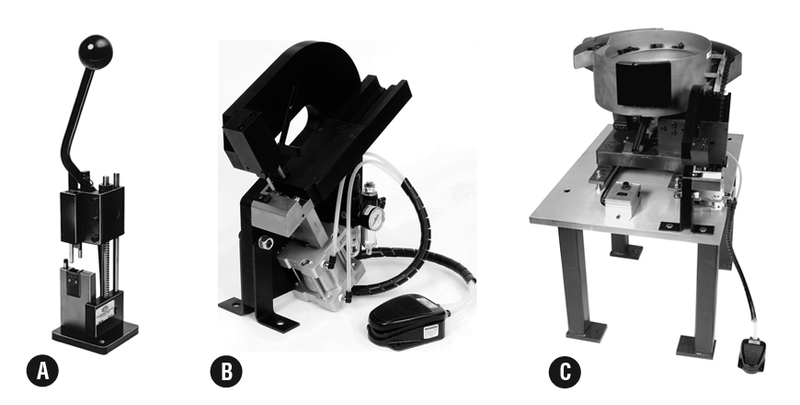 Optional guillotine type cutting attachment (not pictured) for the RDD Footlock™ and Autolock™ application equipment. The Lockit™ Guillotine removed the RDD hinge after attachment to the cable, thus reducing the clearance required for easy installation of the RDD/cable assembly, into the panel.